I'm starting my outer orbit of London in Dartford. It makes sense to start on the banks of the Thames and head clockwise, even if that means going straight back to the end of my recent bus journey. Dartford's one of the smaller districts I'll be visiting, which is probably a good thing to keep things manageable for my first jaunt. The district is split fairly evenly in two by the A2, north of which is most of the population, and south of which is most of the countryside. I spent all my time in the riverside half, sorry, but that's where the more interesting stuff is. Four places in total, two of which had long been on my "I really must go there" list. You may be surprised. They take their heritage seriously in Dartford. That's because the town's existed for centuries, in a key location close to the Thames on the road to Canterbury. And they've had a museum for over 100 years, initially separate, then in 1937 linked in with the new library. The exterior's splendid, with name carved in stone and a colourful coat of arms upon the pediment, as you'd expect from architecture of a Carnegie persuasion. The interior's more municipal, basically one long room, but filled with all sorts of varied local treasures. Don't expect interaction and lots of buttons to press. The attendant sits out of the way in a cubbyhole, ignoring you unless you want to buy paraphernalia, and the exhibits are generally a selection of things in glass cases. You're supposed to go round anti-clockwise, which I failed to do so began with the QE2 bridge and ended up in the Stone Age. More about both of those later. In pride of place is the Darenth Bowl, Kent's finest Saxon artefact, a moulded glass chalice inscribed with a Christian monogram dating back to the 5th century. Rather more modern is a set of drawers from the interior of a local drapers shop, all choice fabrics and school uniforms, and splendidly evocative to those of us who just-about remember. The current temporary exhibition looks back to Dartford in the run-up to World War One, with a series of wonderfully detailed historical vignettes that bring the period properly to life. And OK, so the whole display set-up at the museum looks like it's stuck in the 1980s, but I was impressed by the delivery of information rather than fluff. Opens weekday afternoons (Wednesday excepted), and all day Saturday. And it's free. Much of Dartford, let's be honest, is not pretty. A dual carriageway carves to the north of the town centre past some plain boxy warehouse type shops, forcing access from the railway station across a high footbridge. The high street has a below-par sequence of shops, and a lively but artisan-free Saturday market. Many of the surrounding residential areas are, let's say, "affordable". But I knew I could find some pretty spots if I looked, and indeed I could. One Bell Corner: Bang in the centre of town, where Watling Street used to rattle through, is a street corner named after a pub demolished in 1966. The replacement building is now a Paddy Power, which speaks volumes, but look up at the lateral wall and there's a damned fine mural. 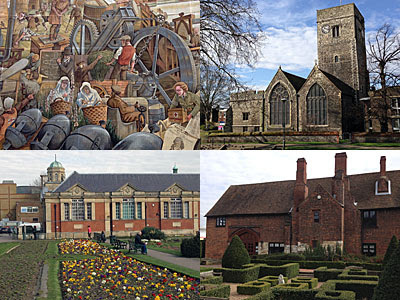 It's called "One town that changed the world", and depicts a tableau of all sorts of industrial activities that Dartford brought forth. If I'd bought the explanatory postcard at the museum I could have told you precisely what they were, but it looks like paper, aeronautics and cement were involved, amongst others. High Street: Traffic now goes elsewhere, which helps, but there's not a great deal of cultural merit. Look up above Boots to see the town's top blue plaque, remembering an inn Jane Austen once stayed in, now demolished. But the best bit's down on the banks of the Darent, where stands the parish church. Holy Trinity dates back to 1080, later enlarged to cater for passing pilgrims, with the square tower more late medieval. St Edmund's Pleasaunce: Across the river, up East Hill, the land swiftly rises. Take 90 steps (or the zigzag ramp) to reach the plateau, with fine views across town towards West Hill and beyond. When Holy Trinity's churchyard filled up they switched burials to the Pleasaunce, a particularly unusual situation given that graves here are higher than the adjacent church tower. The most famous internee is Richard Trevithick, inventor of the first railway locomotive, who was working nearby when he died penniless at the Bull Hotel in 1833. I couldn't find his plaque, but you may have better luck. Central Park: Dartford's finest park runs down the side of the library towards Brooklands Lakes. Here the town's alcoholics meet to sip from cans amongst a riot of bedding plants. Abundant blossom surrounds the empty bandstand, while the skateboard park bustles with excited teens. I found a metal stencil statue of Mick Jagger by the Darent, the same image that's etched into the window of the new railway station. And the Cafe In The Park may well be the best place for a touristy cuppa if you ever decide to visit. Manor Gatehouse: Henry VIII built about 40 manor houses around the country so that he always had somewhere to stay. One of these was in Dartford, covering 12 acres, and was given to Anne of Cleves to live in after Henry's death. Almost all is long demolished, save the gatehouse, which is now used as Dartford's registry office for Marriages and Partnerships. Come on a weekday and you probably can look inside and admire the Tudor beams. Come on a dead Saturday and you'll have to admire the chimneys and ornamental hedges from outside. The QE2 Bridge at the Dartford Crossing was opened on Wednesday 30th October 1991. The Queen came, obviously, plus a five hundred strong choir and the Band of the Corps of the Royal Engineers. The celebratory luncheon kicked off with Smoked Salmon Balmoral, progressed to Tender Rack of Lamb (with a hint of garlic), and ended with crème brûlée, coffee and champagne truffles. And ever since then, weather permitting, traffic has rumbled south over the four lane highway, doubling the capacity afforded by the original tunnel. The bridge has a cable-supported 812m span - at the time Europe's longest - and a clearance of 57m - sufficient for all but the very largest ocean-going liners. It's still a mighty impressive feat of civil engineering. And having only just told you about riding a bus over it, yesterday I went and stood underneath it. The upper span curves in from the Thurrock bank, supported by a number of tall concrete pillars. A succession of cars and lorries pour across, or dribble if traffic's light as it seemed to be yesterday. The most impressive sights are the cables strung from the steel pylons to either side, creating a series of ever decreasing triangles in the sky. From underneath you can see the maintenance gantries, and from directly underneath a narrow strip of metalwork casting its shadow upon the water. A few ships glided underneath while I was there, their bow wave rippling heavily against the banks after they'd passed. Without the bridge this would just be an anonymous piece of foreshore with estuarine views of silos and warehouses. With it, suddenly this is the most important point of connection downstream of Woolwich. I love a major bit of infrastructure, and it was great to be able to get right up close to this one. And this is my kind of footpath, remote and yet wide open, with privileged access to somewhere very special along the way. I could have continued round the back of Littlebrook Power station, but I no longer trusted my map enough to know whether or where that would bring me out. Instead I headed back to the bus stop, then downstream to my next destination.